For our brand-new school year, we have begun something new. We are working through The 10 Minute Bible Journey from New Leaf Press. Once upon a time, we were pretty consistent about reading the Bible as a group for school. We would pick a plan and go through the Bible in a year. 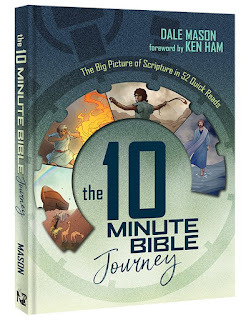 We started with some pretty basic story Bibles, moved into some in fairly easy language, went through a chronological Bible, used a podcast version, and more. But everyone started going off in different directions and it was hard to get everyone together for long. Group Bible reading fell to the wayside. When I had a chance to check out this book, I thought it looked interesting. I had no idea that it could lead into rekindling that particular habit. The book includes 52 fairly short readings that start "In the beginning..." and end in Revelation. They aren't straight Bible stories, but they weave apologetics in alongside the words from the Bible. And they really do take only about ten minutes. The back of the book has a Bible Reading Plan that we are now officially following. They call it a "Summary First" method, where you start by reading through this book, to get a summary view of the entire Bible before you dive in to all of the details of the Bible itself. 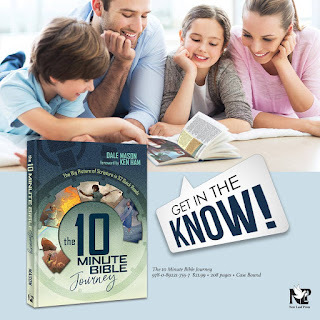 Once you start working through the Bible, they have you going in a more-or-less chronological way. I also love that all of my kids are getting something out of this book. They range from 11 to 18, and this bite-sized chunk thing is great for them all. We are making a lot of use of the footnotes, which are extensive, and we find ourselves going and looking up the Hebrew with some electronic resources (we're still in the Old Testament). The best thing for me is that we started this on some random date in August. I can bookmark it, and on days we are home, we read the next one. On days where everyone is off in different directions, we don't necessarily get to it. Since there are no dates or week designations at all, we don't have to feel guilty that we aren't keeping up. I certainly recommend this book, and highly recommend using it as a family.